What are the Dangers in Terms of Cycling Safety? Accident rates per kilometer are 26 to 48 times higher for bikes than for automobiles (13). Nearly 44,000 cyclists have died in traffic crashes in the United States since 1932 (the first year in which estimates of cyclist fatalities were recorded) (14). 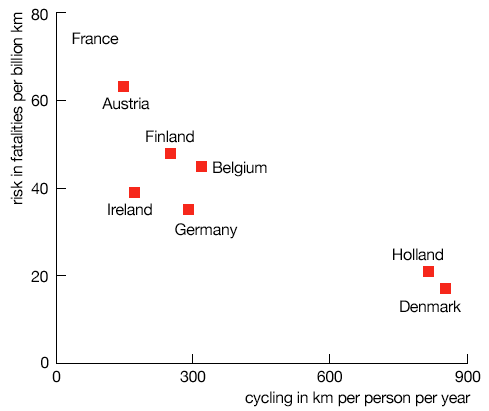 U.S. cyclists are three times more likely to be killed than German cyclists and six times more than Dutch cyclists, whether compared per-trip or per-distance traveled (7). According the British Medical Journal, the most important deterrent to riding bikes expressed by non-cyclists is fear of motor traffic (15). While motorists often accuse cyclists of being the cause of bike-car accidents, a Toronto analysis of 2572 police collision reports (Table 1) demonstrates that this is actually not the case. The most common type of crash in this study involved a motorist entering an intersection controlled by a stop sign or red light, and either failing to stop properly, or proceeding before it was safe to do so. The second most common crash type involved a motorist overtaking unsafely. The third most common type of crash is a motorist opening a door onto an oncoming cyclist. In fact, cyclists are the cause of less than 10% of bike-car accidents in this study (1). From: Tomlinson, David. Conflicts Between Cyclists and Motorists in Toronto, Canada (1). Data from Canada suggests that provinces that have invested the most in cycling tend to have the highest rates of cycling and also the lowest rates cycling mortality. Quebec has invested more than any other province on cycling (5). 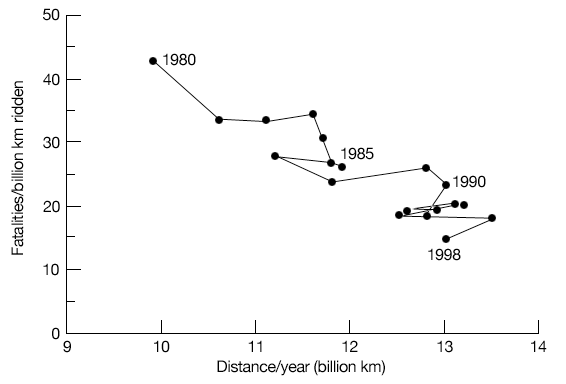 For the period 1987 to 2000, the total number of bicycles in Quebec more than doubled, and the number of regular cyclists increased by 50%, while cycling fatalities fell by 42%, serious injuries fell by 56%, and minor injuries fell by 38% (5). Data from Europe (Figures 1and 2) also suggests that counties that have invested the most in cycling tend to have the highest rates of cycling and also the lowest rates cycling mortality (6). A 30% increase in cycle traffic is associated with a two-third reduction in risk, e.g. a decrease of the total number of fatal cycling accidents (6). Motorists overtook more closely when he wore a helmet than when he didn’t. Cars gave him the most room, trucks less room and buses the least room of all. By wearing a wig, he found that cars gave him more room when he appeared to be a female cyclist. As levels of pedestrian and bicyclist activity rise their per capita risk falls. Drivers adapt their behavior in the presence of increased cycling and walking (17). Won't Mandatory Helmet Laws for Cyclists Fix the Problem? How Dependant on Cars Are We? What Can We Learn From Other Regions? What is the Economic Cost of Inactivity? What About Links to Public Transportation? What are the Benefits to Government When They Invest in Cycling? What Policies Make a Difference?